Raymell Mourice Rice (born January 22, 1987) is a former American football running back who played his entire professional career with the Baltimore Ravens of the National Football League (NFL). He played college football for Rutgers, and was drafted by the Ravens in the second round of the 2008 NFL Draft. He is ranked as the Ravens' second all-time leading rusher behind Jamal Lewis, and is also second in rushing attempts and touchdowns, and third in combined touchdowns. He won Super Bowl XLVII with the team over the San Francisco 49ers at the conclusion of the 2012 NFL season. In March 2014, Rice was arrested and subsequently indicted for third-degree aggravated assault relating to an incident in which he assaulted his then-fiancée (now wife). The incident became a prominent controversy after celebrity news website TMZ released a video of the encounter, which led to an NFL policy change regarding how it handles domestic violence cases. Rice's contract was terminated by the Ravens in September 2014, following the release of an additional video of the incident. He was subsequently suspended indefinitely by the league, but was later reinstated after he successfully appealed the decision in federal courts. Rice was born in New Rochelle, New York, to Janet Rice and Calvin Reed. Reed was killed in a drive-by shooting when Ray was a year old. Rice's cousin, Myshaun Rice-Nichols, was killed by a drunk driver when Rice was ten. Rice attended New Rochelle High School, where he played football with Courtney Greene for long-time coach Lou DiRienzo. He was the Huguenots' primary running back. The last Iona-New Rochelle Turkey Bowl football game, which had been waged every year since 1949, was played in Rice's sophomore season of 2002, when NR trounced the Gaels, 58–7. Rice led his team to a state title as a junior in 2003 when NRHS defeated Webster Schroeder 32–6 at the Carrier Dome in Syracuse. In Ray Rice's senior year of 2004, New Rochelle fell to Christian Brothers Academy, who had Greg Paulus, 41–35 in the championship game. New Rochelle High School lost only one game in each of Ray Rice's three seasons of varsity football. Rice holds the state record for yards in a single game: he gained 462 yards on 42 carries on October 24, 2004. Rice attended Rutgers, where he played football for coach Greg Schiano's Scarlet Knights from 2005 to 2007. In 2005 (Rice's freshman year), Rutgers had its first winning season in 25 years and played in only the second bowl in the football program's then 136-year history. In 2006, the Scarlet Knights won a school record-tying 11 games and registered the school's highest ever season-ending national poll ranking, finishing at #12 in both the Associated Press and Coach's Polls. As a true freshman Rice finished the season as the starting tailback for Rutgers. Rice rushed for 1120 yards and 5 TDs during his freshman campaign, including a 217-yard performance against the Connecticut Huskies. Rice gained 1,794 rushing yards in 2006 with 20 touchdowns. His total in 2006 set Rutgers' single-season rushing yardage record, shattering J. J. Jennings' mark of 1,353 set in 1973. Rice's backfield partner during his freshman and sophomore seasons was fullback Brian Leonard. Leonard considered entering the NFL Draft in 2006 but stayed for his senior year and took on a less prominent role in the offense which aided Rice's rise to stardom. Rice was also a finalist for the Maxwell Award and finished seventh in the Heisman Trophy voting. Rice was named Big East offensive player of the week a school-record three times in 2007. All three times, Rice rushed for over 200 yards, including a career high 225-yard game against the Pittsburgh Panthers. Rice ended his sophomore season with 170 yards on 24 carries with 1 touchdown during the inaugural Texas Bowl to give Rutgers its first bowl victory ever in a 37–10 win. He was named MVP of the game. Rice was widely considered a candidate for both the Maxwell Award and Heisman Trophy in 2007. On October 6, 2007 against the Cincinnati Bearcats, Rice scored his 35th career rushing touchdown, setting the all-time program record. On November 9, 2007 against the Army Black Knights, Rice ran for 243 yards and scored twice in the 41–6 win against Army, setting a new school record previously set by Terrell Willis in 1994, and his new single game record. On January 5, 2008, at the second annual International Bowl in Toronto, Rice ran for a new school record of 280 yards, along with 4 touchdowns as Rutgers beat Ball State University 52–30. One of the TD runs was the longest of his career (90 yards). Rice won the MVP award for his performance. On January 8, 2008, Rice declared his intention to enter the 2008 NFL draft. Rice was drafted by the Baltimore Ravens in the second round (55th overall) of the 2008 NFL Draft and signed a 4-year deal with the Ravens worth $2.805 million plus a $1.1 million signing bonus. He played for coach John Harbaugh, who coincidentally was in his first year as coach of the Ravens. Rice wore number #39 during the preseason then switched to #27 (his number at Rutgers), after the Ravens cut cornerback Ronnie Prude. Rice made his first start in his first NFL game (Week 1 of the 2008 season against the Bengals). Rice had a team-high 22 carries which was good for 64 yards, fumbling once. 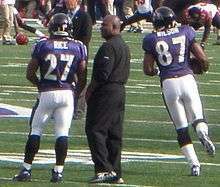 Rice also had three receptions for 19 yards, in the Ravens 17–10 win over the Cincinnati Bengals. Rice had his best game of the season in Week 9 against the Cleveland Browns filling in for the injured Willis McGahee where he ran for 156 yards on 21 carries. Rice finished out the season with 546 rushing yards on 107 carries and had 273 receiving yards on 33 receptions. In the season opener against the Kansas City Chiefs, Rice rushed for 108-yards on 19 carries, which was his second career 100-yard rushing game. In week 3, Rice rushed for his first pro touchdown against the Browns. On October 11, 2009, he caught his first touchdown reception against the Cincinnati Bengals. On October 18, 2009, (Week 6) Rice led his team in both rushing and receiving yards against the Minnesota Vikings. He rushed for 77-yards off 10 carries, scoring 2 touchdowns. He also caught 10 passes for 117-yards in the loss. In week 14, Rice had career-bests 166 rushing yards and 216 total yards, scoring one touchdown. In week 16 at the Pittsburgh Steelers, Rice rushed for a career-high 30 times for 141 yards, which broke a Steelers streak of 32 consecutive games without a 100-yard rusher. He finished the season with 254 carries for 1,339 yards and 7 touchdowns, averaging 5.3 yards per carry. In the wildcard playoff game against the New England Patriots on January 10, 2010, Rice scored an 83-yard touchdown on the first offensive play for the Ravens, the longest play for the Ravens that season, the longest rush of his NFL career and the 2nd longest rush in NFL postseason history. On December 20, 2010, against the New Orleans Saints, Rice amassed a career-best 233 yards from scrimmage (153 rushing and 80 receiving) to go along with two touchdowns. The 233 yards are also the third most in Ravens franchise history. For his efforts, Rice was awarded his first AFC Offensive Player of the Week award. On January 9, 2011, in the Wild Card round of the playoffs against the Kansas City Chiefs, Rice became the first Ravens RB to have a receiving touchdown in a playoff game. Ray Rice finished the 2010 season with 1,220 total rushing yards, and 556 total receiving yards. This was his second straight season to amass 1000 rushing yards. The 2011 season started off well for Rice. In week 1 against the Pittsburgh Steelers Rice gained 107 yards rushing and 1 touchdown, while making 4 receptions for 42 yards and 1 touchdown. The Ravens would win that game 35 to 7. This performance was only the second time a running back had gained more than 100 rushing yards against the Steelers defense since the 2009 season, both belonging to Rice. In week 10 he threw his first career passing touchdown. It was a 1-yard completion to tight end Ed Dickson in a loss to the Seattle Seahawks. In week 13 of the 2011 NFL season Rice ran for 204 yards on the Browns including a 68-yard run and 1 touchdown. Ray Rice had four games so far in the season where he has rushed for more than 100 yards, and has over 1000 yards rushing for a third straight season. For his play against the Patriots, Rice won AFC Offensive Player Of The Week. For his performance, Rice was also tabbed as the new cover athlete for the NFL Blitz video game by EA Sports available on XBLA and PSN. In the following game, Rice ran for 103 yards on 26 carries and averaged almost 4 yards per carry while scoring a touchdown and a losing fumble in the win against the Indianapolis Colts. In week 17 against the Bengals Rice rushed for 191 yards that includes a 70-yard touchdown run in the first two minutes of the game and then rushed for a 51-yard touchdown. Rice finished the season with 1364 yards off 291 attempts averaging 4.7 yards a carry. He also had 12 TDs. He was 2nd in the league in total rush yards and finished 1st in total yards from scrimmage. Rice had 704 receiving yards off 76 catches averaging 9.3 yards a reception. Rice was selected to his second Pro-Bowl in 2011 and voted to the NFL All Pro Team. On November 25, 2012, the Ravens were down 3 with under 2 minutes left in the game away against the San Diego Chargers. The Ravens had the ball at their own 37 on a 4th and extremely long 29. Quarterback Joe Flacco passed short middle to Rice, who followed up by avoiding defenders for 30 yards and getting the first down in what Ravens' coach John Harbaugh dubbed as the play that will "go down in history." The Ravens went on to tie the game at the conclusion of the drive with a field goal, and won the game in overtime. For his performance, he received the AFC offensive Player of the Week award  and the GMC Never Say Never Moment of the Week Award. On February 3, 2013, the Ravens defeated the San Francisco 49ers in Super Bowl XLVII, earning Rice his first Super Bowl ring. In 2013, Rice got off to a slow start. He was injured, and the Ravens' offense was not functioning properly. In Week 11, Rice had his best game of the season, rushing for 131 yards on 25 carries in the Ravens 23–20 overtime loss to the Bears. He rushed for 660 yards on 214 carries for 4 touchdowns on the season. While on suspension for his domestic violence case, Rice was released by the Ravens on September 8, 2014. After the public release of the video of the incident, the NFL announced Rice was suspended indefinitely. Moreover, the Ravens recalled all Rice items from their pro shop as well as other known stores nationwide, and announced an exchange program the day after. Shortly after, it was announced that Rice would appeal the suspension on the grounds that he was suspended twice for the same offense, which is a violation of league rules. On November 28, 2014, it was announced that Rice won his appeal to be reinstated in the NFL. On January 15, 2015, Rice and the Ravens reportedly agreed to settle in Rice's lawsuit against the team. He had sued for $3.529 million in back pay that he would have earned for the final 15 weeks after serving the NFL's 2-game suspension. The settlement came immediately before the hearing was to begin in Baltimore. This effectively ended the litigation between Rice and his former team. On February 15, 2014, Rice and his then fiancée (now wife), Janay Palmer, were arrested and charged with assault after a physical altercation at the Revel Casino in Atlantic City, New Jersey. Rice and Palmer were both highly intoxicated during the incident. Celebrity news website TMZ posted a video of Rice dragging Palmer out of an elevator after apparently knocking her out. The Ravens issued a statement following TMZ's release of the video, calling Rice's domestic violence arrest a "serious matter". The matter was handled by the Atlantic County Prosecutor's Office. On March 27, 2014, a grand jury indicted Rice on third-degree aggravated assault, with a possible jail sentence of three to five years and a fine of up to $15,000. Rice married Palmer six weeks after the incident on March 28, 2014. For the incident, Rice was suspended for the first two games of the 2014 NFL season on July 25, 2014. The criminal charges were later dropped after Rice agreed to undergo court-supervised counseling. In a news conference announcing longer suspension lengths for future domestic violence incidents, NFL Commissioner Roger Goodell said that he "didn't get it right" in deciding Rice's punishment. In January 2015, the Baltimore Ravens settled the claim after Rice filed a formal grievance against the NFL for wrongful termination. Rice demanded $3.5 million based on the claim that the Ravens imposed a second punishment upon him by terminating his employment weeks after the NFL levied a two-game suspension. Although the details of the settlement were not disclosed, it was estimated that he received most of his claim. In 2016, he vowed to donate 100% of his salary to domestic violence charities if he were signed by a team. ↑ "Ray Rice's Amazing Story". BaltimoreBeatdown.com. May 19, 2010. ↑ "Ray Rice Biography". JockBio. ↑ "Janet Rice is Ray's Super inspiration". ESPN. ↑ "Fueled by tragedy, Ravens' Rice never has forgotten roots on ascent to NFL stardom". NY Post. January 24, 2013. ↑ Pedulla, Tom. (April 17, 2007) RB Leonard carries one chance at two dreams. Usatoday.com. Retrieved on July 17, 2012. ↑ "Rice gains 170 yards rushing in Rutgers' first bowl win". ESPN.com. Retrieved September 19, 2014. ↑ "Single Game Rush Record". ESPN.com. Retrieved September 19, 2014. ↑ "Rice Declares for 2008 NFL Draft". Retrieved September 19, 2014. ↑ "Baltimore Ravens – History – All-Time Pro Bowl". Baltimore Ravens. Retrieved September 8, 2014. ↑ "Baltimore 33, New England 14". ESPN. Retrieved January 12, 2010. ↑ Ravens Insider. Weblogs.baltimoresun.com (March 23, 2011). Retrieved on July 17, 2012. Archived December 25, 2010, at the Wayback Machine. 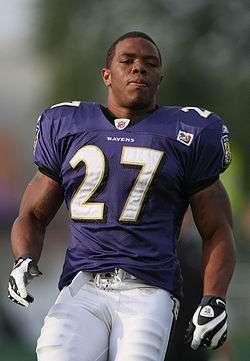 ↑ "Ray Rice of Baltimore Ravens signs 5-year, . Retrieved July 16, 2012.". ESPN.com. Retrieved September 19, 2014. ↑ "Ravens coach John Harbaugh says Ray Rice's Fourth and 29 play "will go down in history". Baltimore Sun. Retrieved September 19, 2014. ↑ "Ray Rice wins AFC Offensive Player of the Week honors". Retrieved September 19, 2014. ↑ "Ray Rice's heroics lift Ravens past Chargers voted Week 12 GMC Never Say Never Moment of the Week". Retrieved September 19, 2014. ↑ "Ray Rice released by Baltimore Ravens". NFL.com. ↑ Darren Rovell, "Fans can exchange Ray Rice jerseys," ESPN, September 9, 2014. ↑ "Ray Rice plans to appeal suspension". ESPN.com. ↑ Van Natta Jr., Don; Brandt, Andrew; Schefter, Adam (December 1, 2014). "Ray Rice wins appeal, eligible to sign". ESPN. 1 2 Wilson, Aaron (January 15, 2015). "Ravens, former running back Ray Rice settle grievance, sources say". The Baltimore Sun. 1 2 Hensley, Jamison. "Ray Rice, Ravens reach settlement". ESPN. Retrieved January 15, 2015. ↑ "AFC Player Rushing Statistics - 2011". ESPN.com. ↑ "Ray Rice – Dragging Unconscious Fiancee ... After Alleged Mutual Attack" (video). TMZ. February 19, 2014. TMZ Sports has obtained footage of Baltimore Ravens running back Ray Rice dragging his fiancee (who appears to be out cold) out of an elevator in an Atlantic City casino ... moments after cops say they attacked each other on the property. ↑ "Atlantic County prosecutor taking over Ray Rice assault investigation after video shows him dragging unconscious woman out of Revel elevator". Philadelphia Inquirer. Interstate General Media, LLC. February 19, 2014. ↑ "Ravens' Ray Rice indicted". ESPN. March 28, 2014. ↑ Reyes, Lorenzo (March 29, 2014). "Report: Ray Rice marries woman he is accused of assaulting". USA Today. ↑ Ken Belson (September 9, 2014). "Ray Rice's Wife Defends Him and Criticizes the Media". New York Times. Retrieved September 9, 2014. ↑ "Roger Goodell: NFL to change domestic violence policy; Ray Rice suspension length was mistake". The Dallas Morning News. Associated Press. August 28, 2014. 1 2 Ravens announce Ray Rice settlement | ProFootballTalk. Profootballtalk.nbcsports.com. Retrieved on July 23, 2016. Wikimedia Commons has media related to Ray Rice.